Bloodfin fin tetra is a relatively large tetra fish with red fin and tail which stands out in a planted aquarium. Bloodfin fin tetra is a peaceful schooling fish for planted and community aquariums but occasionally they tend to nip fins of the long finned fishes. They should be kept in groups of more than 3 per group. 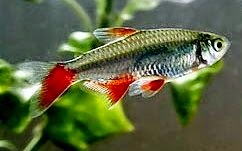 Bloodfin fin tetra fish prefer slightly acidic water for optimum health conditions. If the water quality is maintained and treated with live food, they will spawn easily and live up to 10 years approximately. Albino Species is also available and popular. occasionally exhibits fin nipping behavior. should be kept in 3 – 10 in numbers. their own eggs. Eggs will hatch within 24 – 30 hours.